First off, I want to say that I took this wholesale from the North Carolina School of Science and Math. Thank you NCSSM. They have a conference each year on high school math, and each time I’ve gone, the speakers I’ve liked best are the actual teachers at the school. So any good things you might want to say about this, please don’t say them to me. This is the product of the hardworking teachers over there. So please, please check out the NCSSM project here. All I will be doing in this post is talking about how I coopted it for my classroom. So the year came to a close in my calculus class. And in the last week, I wanted to try something new. And there was a confluence of things that led me to this. I had students teach themselves how to find the area of two curves previously, when I was out sick, but then I didn’t do anything with it. 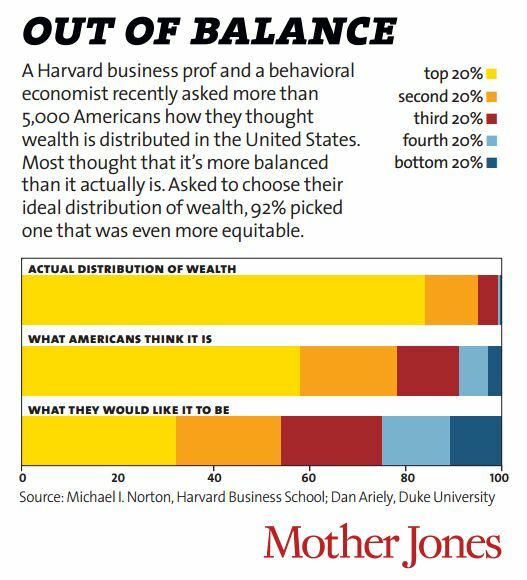 I had also just seen an interesting piece on wealth inequality which piqued my interest. And I had heard of the Gini Index and the Lorenz curve before but had never pursued it seriously. So here we are, the perfect time to go whole hog. And when doing my massive internet search, I came across NCSSM’s awesome activity and realized it was better than anything I could devise on my own. I really loved the scaffolding of the packet. To start out class, I laid out the objective. I showed some photos from Occupy Wall Street. We read the protester’s posters aloud. And we focused on one of them: “This is not the world our parents wanted for us, nor the one we want for our kids.” I focused on that, because it implied that there was a difference in the world from the previous generation. The protester, and others, have been saying that the rich are getting richer while the rest of us are not. And my question to the class is: do you think this is true? We talked about it generally, and I followed it up with a conversation about how we might decide if the distribution of wealth were different now than it was later. Students shared their thoughts in pairs, and they came up with some good ideas. Many pairs talked about making a histogram (wealth vs. number of people with that wealth). Others talked about comparing the top 5% with the bottom 5%. We shared our ideas as a class. I liked making them think about how one might decide this, because the answer is: there are many ways, but they all are going to involve math. We also talked about how we could compare one wealth distribution to another — and then we realized that it became tricky, fast. I then had them make conjectures on the actual distribution of wealth in the US. And then I showed them the true answer. The true distribution shocked them. This initial prelude set up the remaining 2 days kids spent working on this. It gave them our overarching question (“Is income truly becoming more and more unequally distributed in the past 40 years? Or is it propaganda used by Occupy Wall Street protesters and sensational journalists?”) And off then went. Each day, I had a goal that students had to reach, and if they didn’t they were asked to finish it at home. (At most, they only had 5 minutes of work each night. It was the last week of classes, and I wanted it to be more relaxed.) We talked at the start of each class, and I had them work in pairs. We had mini breaks/discussions to talk about big ideas. One of these included the trapezoidal rule. When introducing Riemann Sums a month or two prior, we only did them as left and right handed rectangles. But we saw how bad those approximations would be in this case where we only had 5 divisions… which necessitated the use of the trapezoidal rule. I didn’t teach my kids it, but they could do it. And some found a quicker formula to find the area, because they got sick of calculating all the areas of the trapezoids together. Huzzah! One student make a calculator program to calculate the Gini Index because it became tedious to do the calculations. We ended the packet by just going through the US Gini Indexes for the last 40 years. We didn’t do the part asking for an investigation on other countries. We did this informally. I threw it together, I framed it in the context of Occupy Wall Street, and we went off. I didn’t collect formal feedback from my students on this (it was the last week), but I had a number of students individually let me know how much they liked it. A couple told me it was their favorite thing all year — and they loved that this had applications. 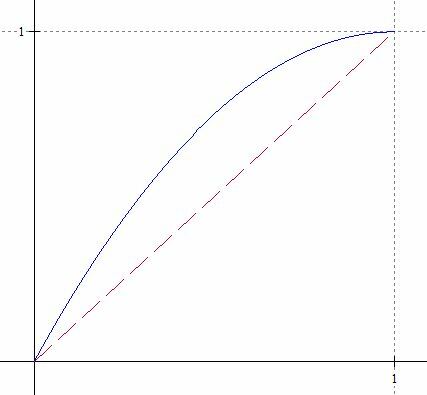 One told me they spoke with an economist last summer and they were talking about economics and calculus, and the economist was talking about the Lorenz curve — but the student (at the time) didn’t understand it. I love that we could clear that up! Also, I had two teachers observe my class the first day we started it, and I had them participate, and they said they enjoyed thinking about the questions and working on the packet. I love the idea of using this in the future. I hope to do so next year, earlier in the year. I think I need to make the packet a little more conceptually deep, and ask some probing questions as we go along. I also think it could easily be extended to be a good poster project. One obvious idea is having students pick two countries, do a little research on them and come up with a hypothesis for which has more income inequality and justify it without mathematics. Then they would calculate the Gini Index for each. Finally they would make a poster showcasing their hypothesis and their findings. Alternatively, I could have students (especially since we analyzed a program which calculated Riemann Sums) see if they could come up with a program that would calculate the Gini Index. As a personal note for next year: Oh yeah, I have to remember to make a distinction between wealth inequality and income inequality. I kept conflating the two, but they are very different and I need to make sure I get that across. So cool. And on your last note: income being the derivative of wealth, there are a whole host of FTC-ish questions to ask about the connection. Genius. I need to remember to add this into the unit next year. Perfect perfect perfect. Rethinking schools would love this! Their Rethinking Mathematics book didn’t have much at this level. I will look forward to using this in my class. Thanks. Another point that might extend the conversation: it’s true that (net) income is the derivative of wealth — but only if you’re one of the suckers who works for a living. In other words, one of the 99%. The 1% don’t need to have “incomes” per se. They have capital gains. If they do happen to hold a wage-earning job, the “income” they take home in the form of a paycheck, bonuses, and even stock options is nowhere close to the rate of change of their wealth. I bet the wealth disparity between a neurosurgeon and a minimum-wage earner is tiny compared to the disparity between either of them and Bill Gates. His wealth is busy making money from itself in some tax-sheltered investment… (cue: more math). It is an impressive work. Good job! A bit off topic here, but I am reaching out for the collective wisdom of the readers of this blog. Our school is undertaking the beginnings of a STEM initiative in the fall. Our director has an idea to explore the election process across the curriculum through different lenses and she has asked me to bring the math department on board with some activity ideas that are appropriate for different math levels. I know that NCTM has a few activities posted in the Illuminations section and I am hoping to gather some wisdom from the math blogosphere. My email is jdoherty@wyomingseminary.org and I thank you in advance for any ideas to share. I also want to thank Sam again for such an engaging forum. I am always psyched when I see an email notifying me of a new post here. Pingback: Math Teachers at Play 52 « Let's Play Math! I am so glad I found your blog. It is my favorite blog I have ever found. This is a great application to that trapezoidal rule that just seemed tedious for my students before. I am going to put this activity there. I really cannot thank you enough for all of the resources and ideas I am learning about from going through your blog. I looove trying to connect the math waves of thinking to current events and this is perfect.